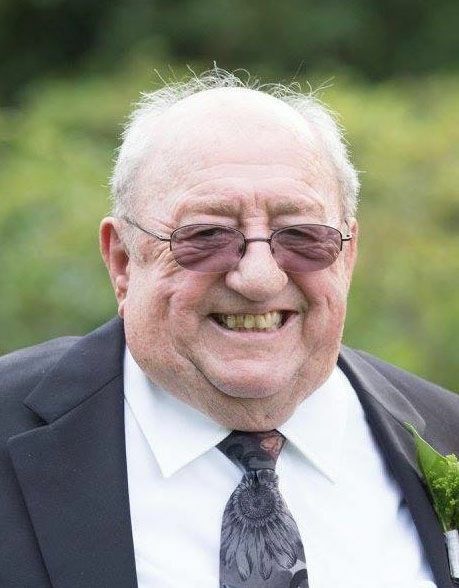 Richard Joseph Pearsall, 83, of Haverhill, passed away on March 27, 2019 at Holy Family Hospital in Methuen, MA. He was born on April 20 1935 in Lowell, MA to the late Ralph and Grace (Vadeboncoeur) Pearsall. Richard grew up in Lowell, Ma until moving to West Gloucester, Ma in 1948. He attended St. Patrick’s School and Keith Academy and graduated from Gloucester HS in 1952. He received his BS in Mechanical Engineering in 1956 from the University of Maine in Orono. In 1963 he earned his MBA from Northeastern University in Boston, Ma. Upon graduation he went to work for United Shoe, fondly known as “The Shoe,” as a Professional Engineer in Beverly Ma. There he enjoyed working on many diverse projects, ranging from space shuttle docking, nuclear power refueling systems, and many automated assembly applications. In 1967 he partnered with James Snow to purchase G.E. Van Wert Company, a small manufacturing distributer where he worked for 52 years. Richard loved his job, working with his head and his hands, always solving engineering challenges. He continued to be active in his career until his last days. Richard is survived by his loving wife, Dorothy (Labbe). They were married just shy of 59 years. He is also survived by 7 children: Ralph, Gregg and his wife Stephanie, Diahne and her husband Thomas, Eric and his wife Melanie, Alan and his wife Brooke, Ross, and Laurie and her fiancé Evan. He also leaves 9 Grandchildren: Allison (and husband Matthew), Matthew, and Sarah, Lee Ayn, William and Dorothy, Linden, Lily, Malena and Andrei and two great grand children, Marlow and Sawyer. He is pre-deceased by infant daughter Lee Ayn. He is also survived by his sister Rosemarie and her husband Bruce; brothers Francis and his wife Ann, David and wife Pat, and deceased brother Ralph and many nieces and nephews. He was a great family man and one of his greatest blessings was to being close to family and to be able to be actively be part of all the grand and great grandchildren’s lives. Knights of Columbus. He touched many lives in many different circles and will be missed by all. Family and friends are kindly invited to attend his Funeral Mass on Thursday, April 4 at 11AM to be celebrated at St. Mary Parish, Georgetown. Visitation will be held on Wednesday April 3, from 4 to 8 pm in the Conte - Giamberardino Funeral Home, 14 Pleasant Street, Georgetown. For those who wish, in lieu of flowers, Richard may be remembered through donations to the St Jude’s Children’s Hospital. For funeral home directions or to share a memory, please visit www.cgfuneralhomegeorgetown.